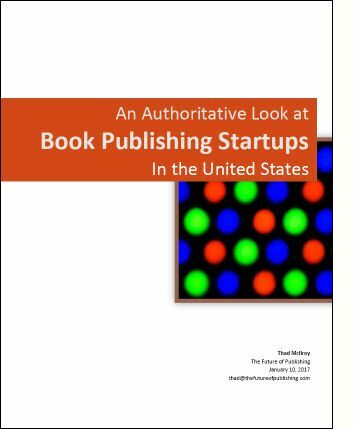 At the link below you can download my new report, An Authoritative Look at Book Publishing Startups In the United States. I’ve been collecting the data in the report for nearly 5 years. I wrote the analysis in December, 2016, determined to publish early this year. • How many startups launched in the last decade? • How many of these are still in business today? • What is the primary business focus of the startups? • How much money have they raised? • How many companies have exited via a merger or acquisition (or in a couple of cases, an IPO)? At the core of the report is an Excel spreadsheet with nearly 900 companies listed. For each company I uncovered their mission statement (or short product description), market focus, amount of money raised (if disclosed), and current status. Some people will be familiar with the pioneering startup list that Michael Bashkar originated. My list continues and expands on Michael’s effort, with three times as many companies and more detail on each. I did the work to satisfy my own curiosity and to understand the nature of innovation in the publishing industry — in the absence of visible innovation at the established book publishers, most notably the big five. So where will we find the future of the publishing industry? Among these companies and the others that follow on the startup path. The report is available for free. Also available is the Excel file where I compiled the base data. Please let me know if the report is useful to you. And of course any errors or omissions. Download the Excel spreadsheet here. March 19, 2017: I’ve learned that Nina Klein also maintains a startup list, started in 2013. Her list includes about 175 companies, broken into 11 classifications, and includes keywords describing each company. Thanks for putting this all together, Thad. It’s very useful. I always enjoy reading your analyses. Thanks, Kris. I enjoyed working on the project. Something I thought I’d mention is about fundraising… I hypothesize that startups over-report their first rounds of capital and under-report subsequent rounds. Here’s my argument for why this is so. When you’re starting out as a founder you spend a lot of time reading TechCrunch which is basically a bulletin board for funding announcements… so you start to think that real startups raise money (and announce it). There are reasons to announce a round of financing e.g. having a funding announcement can be useful when trying to lure a talented executive away from his/her job at a large company. But these reasons don’t apply to most startups at the first round of financing. What typically happens after a funding announcement on Angel.co, Crunchbase, or TechCrunch is you get swamped with cold calls from recruiters and leasing agents who think you have heaps of cash to spend on new employees and fancy office space. If you’re a smart entrepreneur, you don’t want to waste your time dealing with this tsunami of cold callers ever again. So, when you raise your next round, unless you have a very good reason to announce, you don’t. However, I don’t think this changes the conclusion of your analysis: 1) most publishing startups aren’t funded, and 2) most of the funding went to a very small number of startups. Very interesting insight, Peter. Thanks for sharing. I appreciate the suggestion that a “good little business,” one committed to serving needs long-term in the publishing business, is a worthwhile goal. I’m looking forward to digging into the the data on your spreadsheet. Thanks for this Thad! Very helpful and comprehensive. Please consider adding The Hawaii Project to your list, if you feel appropriate? “The Hawaii Project is a personalized book discovery engine” would be a good mission statement. (https://www.thehawaiiproject.com). Hi Mark: I’ll include it on the next version of the spreadsheet. Thanks. Again, a great service to provide this! Wow. Thad, great report and excellent insights. I believe the issues you raise with start-ups is the same issue one could raise with self-published authors – an intent to “go viral” rather than a true business approach. SPAs mostly believe the “work” is in the writing e.g. publishing the book. In truth, regardless of product quality, marketing is the primary driver of success. Build it and they will come, doesn’t work for start-ups and it doesn’t work for authors. The revenue numbers certainly prove that out…for both. Again, thank you. This just became my new favorite site for information. “Build it and they will come, doesn’t work for start-ups and it doesn’t work for authors.” Well put. Thanks, Raymond.